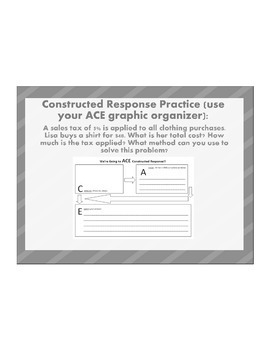 This set of constructed response problems includes 20 questions and a graphic organizer I allow my students to use the 1st 9 weeks. 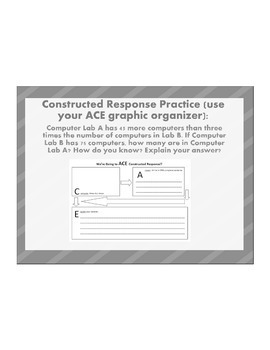 The graphic organizer allows them to Compute, Answer, and Explain. 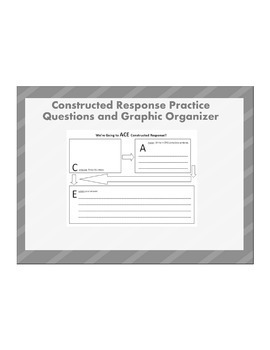 Once the 1st nine weeks is over, I wean them off of the graphic organizer to form paragraph constructed response answers. These questions include both 7th and 8th grade skills - tax, percent error, solving equations, the coordinate plane, circles, angles, squares and cubes, etc. all in real world problems. An answer key is included. I use these with my students 2 times a week. 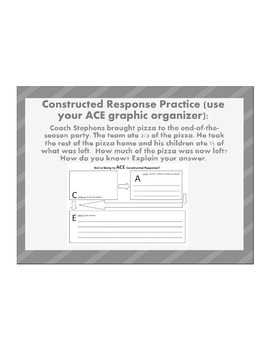 (I use a spiral review 2 days and number talks the last day - all of these can be found in my TpT store). This would be great for beginning of the year 8th graders, end of the year 7th graders, or gifted 7th graders.